When resident in Normandy James Horne joined with others of his faith in services, which then were held in private homes and sought ways to further establish Methodism in what to him seemed "a God forsaken part of the country". 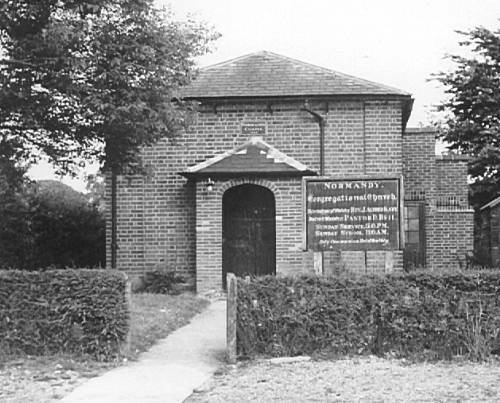 His enthusiasm and religious belief was the inspiration to set up the first official place of worship in Normandy, the Congregational Chapel, Willey Green. Thus in 1825 the small chapel, later and affectionately referred to as The Normandy Chapel, was built by enthusiastic followers with their own hands on land which had been given to them. To quote from The Fellowship of Churches by Joyce Reason, "they were faithful Christians in Normandy, poor in world's goods but not in spirit". For a considerable time they had no full time Minister but were served by either Lay Supplies or by a resident Minister from Guildford. Daniel Deedman was Superintendent of the chapel followed later by Edwin Cranstone, both of whom had helped to establish services and encourage local families to give their support both financially and spiritually. 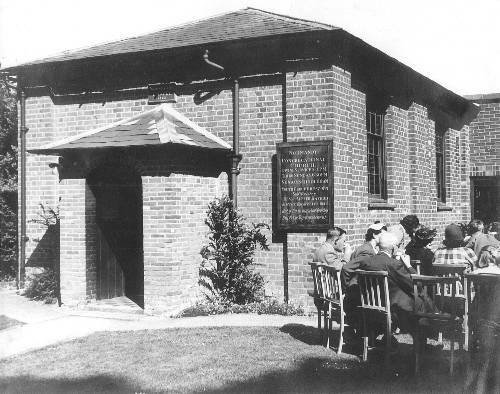 It was a very happy and industrious congregation with a thriving Sunday school for the children of the village. 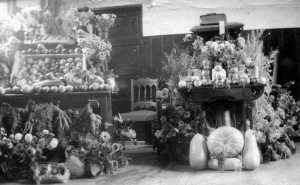 Those children who regularly attended the Sunday school were encouraged by the Women's Fellowship, who met weekly in the chapel, to channel their energy into collecting farthings for the Barnardo homes and institutions, founded in 1867 by Dr. Thomas John Barnardo. When Edwin Cranstone was Superintendent, his daughter Grace kept a record in a cash-book of the collections taken at each service and the custodian of the chapel records holds this cash-book. 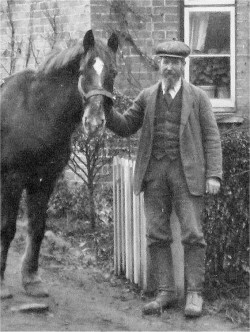 He is outside the house and shop he built in 1903, Park View Cottages, Willey Green. Hymns were sung to the accompaniment of the American Foot Pedal Organ often played from about 1919 by William Fooks when aged only nine. He more or less continued to play the organ until 1940 when he joined the Royal Army Service Corps, seeing out World War II in India until demobilization in 1945 by which time he had obtained the rank of Warrant Officer. During the war years Dorothy Applebee took over the playing of the organ, relinquishing her duties to him on his return from the army. He provided organ music for services until his death in 1974 when once again Dorothy took over the duty for the congregation. Dorothy was often to be seen riding her bicycle around Normandy and through her work at the Post Office in Glaziers Lane acquired, over a lifetime of service there, a wonderful knowledge of most people and house names in the village. the gentleman sitting to her left is Mr William (Bill) Fooks. Harvest festival was a great time in the chapel and was always packed and hymns were belted out like "Come ye thankful people, come" and many others. Ernie Coleman, who also played the flute at services, succeeded Edwin Cranstone as superintendent and in 1951 orchestrated the refurbishment of the chapel in arranging for electricity to be installed and the provision of a new vestry, kitchen and toilets. 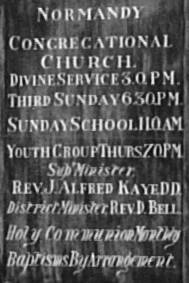 In 1975, when the congregation celebrated the 150th anniversary of its foundation the Moderator, the presiding minister, presented Gladys Marshall with a framed certificate in recognition of 50 years membership of the chapel. She and her sister Elsie were the staunchest of supporters of the chapel. This big event in the history of the chapel was the catalyst for the Officers to consider a larger chapel, for it was obvious that the seating capacity for 60 was inadequate to accommodate those wishing to attend the normal Sunday Service. Since the site was much too small for further development they set about looking for new premises.